The 2017 Institute Address delivered by President G. P. “Bud” Peterson on Thursday, Aug. 31 highlighted both the recent achievements at Georgia Tech and the goals of the Institute for the coming year. The president focused on notable achievements such as the successful medical research projects at Tech in 2017, the announcement of the opening of a new campus in Shenzhen and the achievements of the incoming freshman class. With regard to the future, Peterson highlighted the improvements on campus through plans for new facilities along with the focus at Tech on improving the campus community. There was a significant focus on research achievements at Georgia Tech in the past academic year, with projects such as the development of microneedle immunization patches in collaboration with Emory University being key advancements in the medical field. The president also reminded the audience that the incoming freshman class had a 45% Georgia admit rate and a 23% overall admit rate. Peterson then transitioned to the presentation of the Georgia Tech Scholars Program, which allows automatic admission to all Georgia valedictorians and salutatorians. 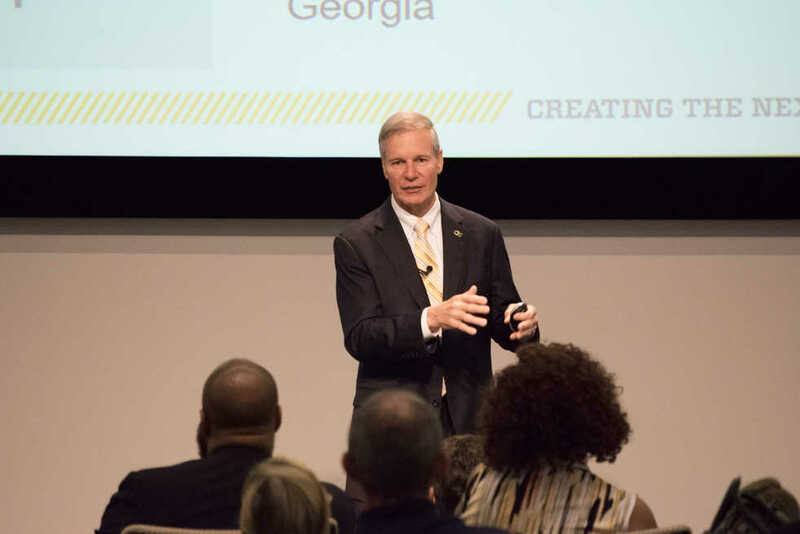 Peterson described the program as a way to “provide students with belief that they can come to Georgia Tech” and noted the importance of ensuring that “the very best aren’t precluded from coming to Georgia Tech”. The topic of the new campus in Shenzhen, China, was also discussed. The president highlighted that Shenzhen is “the fastest growing city in China” and that the new campus would further allow Tech graduates to be “good global citizens”. This expansion of the global footprint is supported by the fact that the men’s basketball team will play their second game of the season against UCLA in Shanghai, China. A “zero carbon footprint living building” on campus was one of the new building projects featured in the address. Additionally, the Library Next project plans to replace book storage on campus with modern learning spaces, similar to those in the Clough Undergraduate Learning Center. The president continued on to the topic of creating an inclusive campus community. There are plans to continue several extremely successful initiatives at Georgia Tech into the coming year. These include the Gender Equity Initiative, Black Student Experience Task Force, and the Staff Council. Peterson said that these initiatives made him “proud to be here at Georgia Tech” and that they “ensure a safe and inclusive community”. For those that were not able to attend this year’s Institute Address, a recording of the speech as well as a transcription will soon be available on the President’s website.